Relations between the two countries hit a new low on Friday after Washington accused Moscow of war crimes following a sustained bombardment of the besieged Syrian city Aleppo, where at least 250,000 people are still living in the rebel-held east of the city. On Saturday, Russia vetoed a motion put to the UN Security Council demanding an immediate end to the bombing campaign in Aleppo. A rival motion proposed by Russia was also rejected at the meeting calling for a fresh ceasefire but did not explicitly mention the bombing. Mr Kiselyov said there had been a “radical change” in the relationship between Russia and the US in recent weeks, the BBC reports. “The loud talk in Washington of a ‘Plan B’ for Syria. Everyone understands what this means: direct military force in Syria,” he said. During Monday’s programme a Russian defence ministry spokesman also warned US bombers not to target the Syrian army. “We’ll shoot them down,” commented Mr Kiselyov. 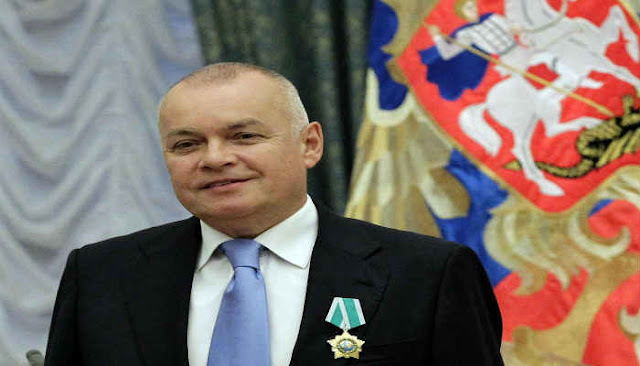 Mr Kiselyov is a key part of Russia’s media operations and has been described as a “militant anti-Westerner” by Russian media and the county’s “chief propagandist”. He is also subject to Western sanctions. In the past he has boasted that Russia was the only single country “genuinely capable of turning the USA into radioactive ash” and claimed last year: "In Syria, America stands on the side of the terrorist caliphate”. His most recent comments come as Russia bolsters its military presence in the Mediterranean and Baltic regions. Russia recently deployed the S-300 anti-aircraft missiles system to Syria and sent three war ships armed with Malakhit cruise missiles from the Black Sea Fleet to the Mediterranean. On Saturday, Moscow confirmed it has started moving nuclear-capable Iskander-M missiles into the Kaliningrad, an act Poland said it considers a matter of the “highest concern”. The German foreign minister claimed that mounting tensions between the US and Russia have led to a global political situation which is “more dangerous” than the Cold War. Writing for German newspaper Bild, Frank-Walter Steinmeir wrote: “It's a fallacy to think that this is like the Cold War. The current times are different and more dangerous”. Former cabinet minister Andrew Mitchell compared Russia’s actions in the Syrian conflict to that of the Nazis before World War II, saying Russia has “shredded” international law by providing military support for Syrian President Bashar al-Assad’s bombing campaign of rebel neighbourhoods. Both Moscow and Damascus deny that strikes deliberately target civilians, and blame the US-backed and al-Qaeda allied fighting factions in Aleppo for the continued violence.